This Saturday, the 13th December, we will be celebrating the music of Ian McLagen. 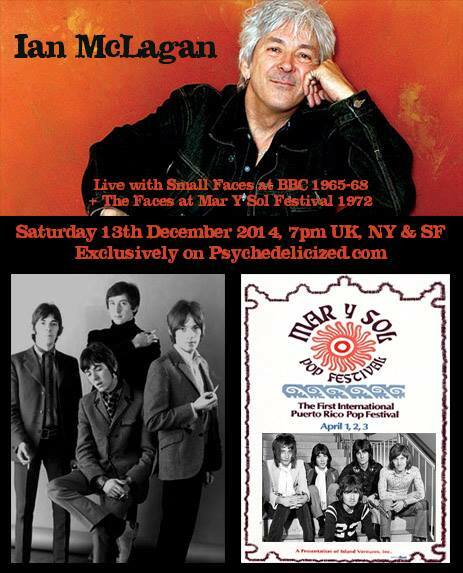 First off, will be the Small Faces at the BBC, followed by The Faces at the Mar Y Sol Pop Festival, Puerto Rico, 1972. I shouldn’t need to big those up to you, so join us and raise a glass to a lovely man of music, Mr Ian McLagen. Saturday, the 13th December, 7pm UK, NY & SF. With Small Faces, Ian McLagan, Ian McLagan & the Bump Band and The Faces.